Jay Kay Seamless Gutter Supply - Supplier of gutter parts and accessories, gutter guards, decorative soffit and trim, and gutter tools. JAY KAY SEAMLESS GUTTER SUPPLY is northern New Jersey’s largest supplier of residential, commercial, industrial gutters, soffit, trim, caulk, copper, galvanized, and mill finished material, gutter guards, snow guards and gutter tools. There is no need to waste your time traveling between your supplier and the job site. Let us know what you need, where you need it, and we’ll take care of the rest. We will prepare all of the materials required for your project the day before delivery. Upon arrival at the job site, we will manufacture your seamless gutters according to your specifications. 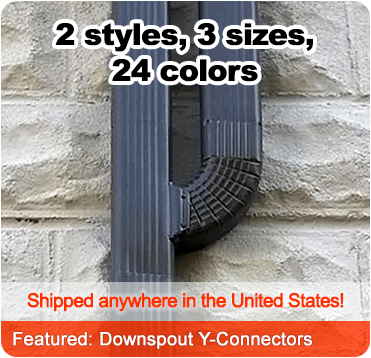 Please be sure to place your gutter parts and accessories order at least 24 hours in advance of expected delivery. Since we do not install the material, you receive it at a fraction of the cost. With over fifty deliveries per day we make sure to provide the fastest, most reliable service in the drop-off industry. High demand on our inventory requires us to keep our warehouses stocked at all times. We never run out of supplies which means the same for you. We look forward to providing you with the best possible service in the industry. If you have any questions, please don’t hesitate to call (973) 616-1669. One of our experienced customer representatives will be happy to assist you with your order, product inquiries, delivery service details, and installation procedures. ©2018 JAY KAY Seamless Gutter Supply. All rights reserved.